Seven new screens from EA Sports show pregame animations, similar to those last seen in last-gen versions of NCAA Football, returning to this year's game. Team-specific presentations, like Ohio State and Florida charging onto the field here, will be a part of the game. 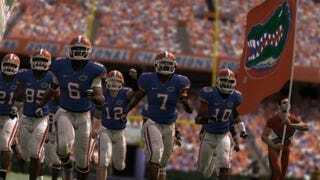 I'm wondering, though, if you're 5-6 midway through a 10-year contract with a five-star school in Dynasty mode, if your team will still lock arms and march on the field with you.